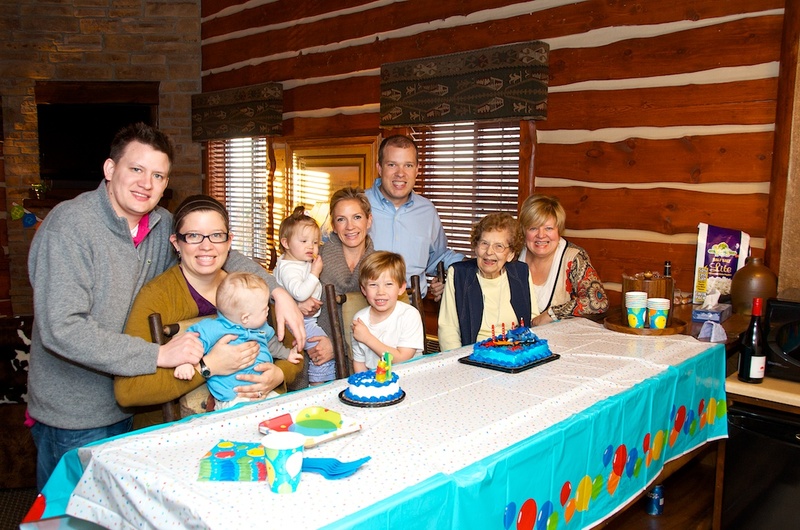 You are here: Home / Family / Great Grandmother Hugs, Fun Crawl Mats, An Early Birthday Cake, And One Proud Son! This is a very special weekend for Noah (and us!) Yesterday was Noah’s first time on an airplane, but what’s even cooler than that is where he was taking the airplane to! This weekend we flew to Missouri to have an early Christmas with my wife’s grandmother, and my in-lawns (who flew in from Colorado.) Noah’s grandparents were in town for the Buddy Walk a few weeks ago, but the last time he got to hang out with his fun cousins was last summer. With all of us living in different states we don’t get to see each other as often as we’d like, so it was great to be able to spend an entire weekend together. Noah’s great grandmother, aunt and uncle! 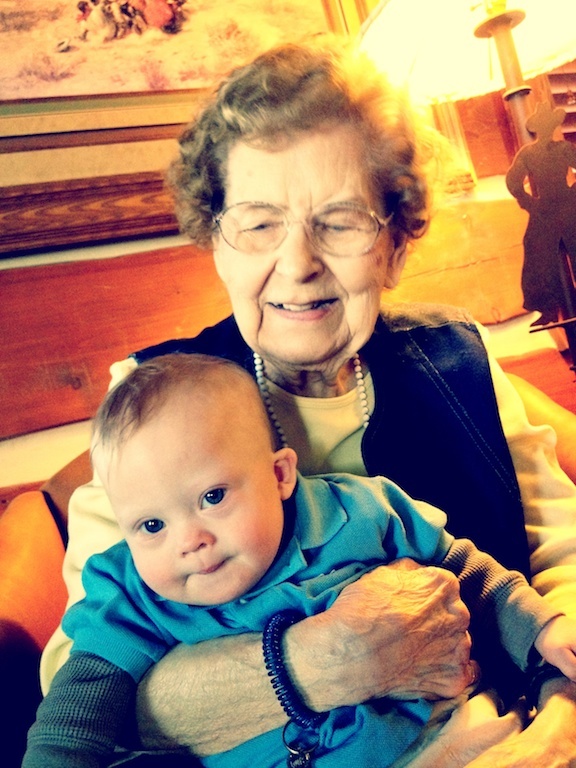 One of the most special things about this weekend was that Noah got to meet his great grandmother for the first time. It was fun watching her face light up when she held him for the first time. Two birthdays are better than one! Since we were all together we decided to celebrate Guy (Noah’s cousin) and Noah’s birthday. (It’s hard to believe Noah’s about to be 1 year old. Wow!) 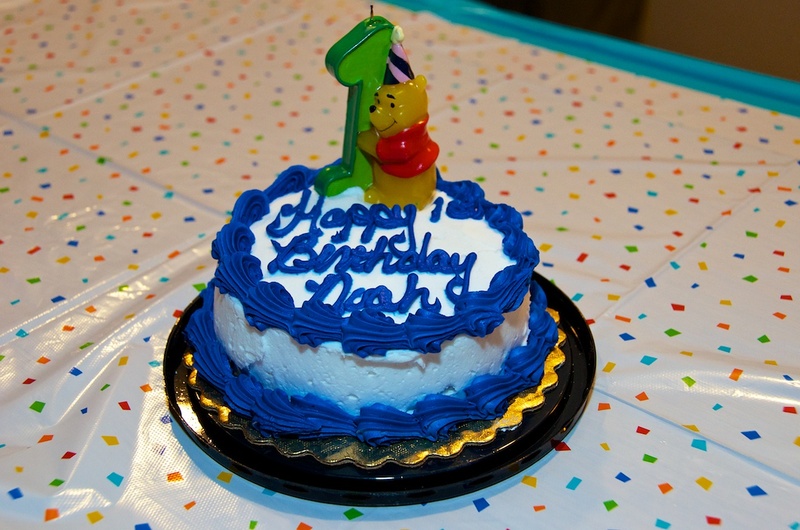 One great thing about celebrating two birthday’s at the same time is that there are two birthday cakes…..and who doesn’t like any party where there are two birthday cakes! Who doesn’t love an early birthday cake? One of my mother in laws friend’s hand made this awesome texture blanket / crawling mat. I wish you could see this entire thing, it’s amazing! It’s very bright and fun, and covered with various textures for Noah to grab. I seriously couldn’t believe someone hand made this; she seriously needs to go in the crawling mat making business! On a side note, this is the 2nd hand made gift Noah has received. 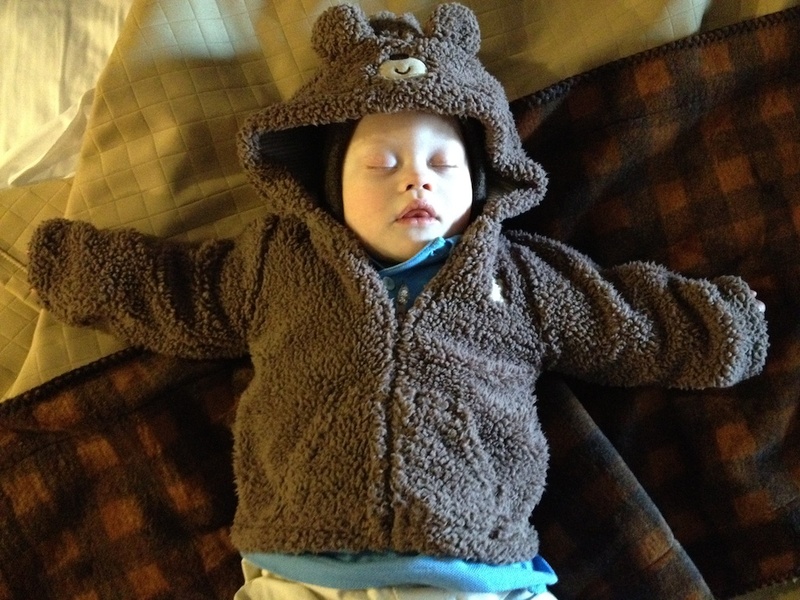 Our friend made Noah a texture blanket which he also enjoys a lot, and is also great for sensory development! Since Noah is still learning how to crawl, we really appreciate these sorts of gifts. Isn’t this a cool crawl mat? Noah had a great time playing with his adorable little cousin! Noah loves his adorable cousin! A huge congrats to my mother! I had to make a tough decision this weekend. After planning the trip, buying airplane tickets, hotel rooms, etc we realized that we had a mix up on when we thought my mother’s college graduation was. Ugggg…..I hate when that happens. One of the main reasons we planned this trip was to introduce Noah to his 98 year old great grandmother, and realistically this weekend may be the only opportunity for that to happen. So we had to make a tough call and miss my mom’s graduation. Thankfully she’s very gracious and understanding and encouraged us to take Noah to see his great grandmother. 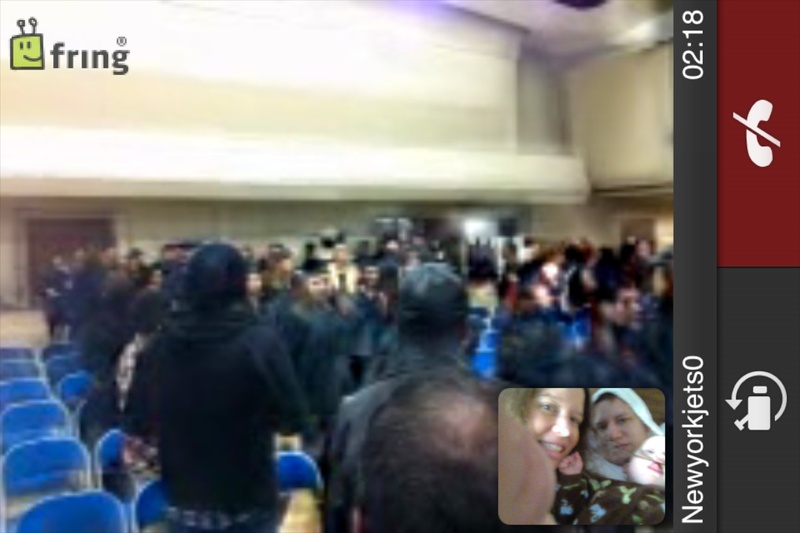 However, thanks to the magic of technology we were able to video chat with my brother live during her graduation so we could still be a part of it…in a cyber kind of way. I’m so proud of my mom for going back to school as an adult and getting her degree. It’s a lot of work, and she nailed it! Also this was her associates degree, and she’s now working on her bachelors’, which means we’ll have a chance to watch her graduate again in a few years! We love you mom and are so proud of you! We knew you could do it! How does your family use technology to stay in touch? Also have you ever “double booked” with your family? Tell us about it in the comments below. What a nice looking family! Noah looks like he was having a great time! Great Grandma looks like a young 98 for sure. We are fortunate that James (and Caleb) has seen his great-grandparents several times. It’s a drive for us, but well worth it. I think that great-grandparents are even more fun than grandparents, because they’re at the age where material possessions aren’t important at all, and they are 100% focused on the boys. Threatening to spill milk on the carpet? Spit up in your lap? Heading to the coffee table full of shiny things? Great-grandparents just love it! My grandparents, though all 80+ now, are very tech-savvy for their age. They frequently Skype with us, so I know that my boys recognize them and know that they are loved. It’s special to me, because my grandparents and their love meant so much to me as I grew up. Besides Skyping with great-grandparents, we connect with grandparents as well. 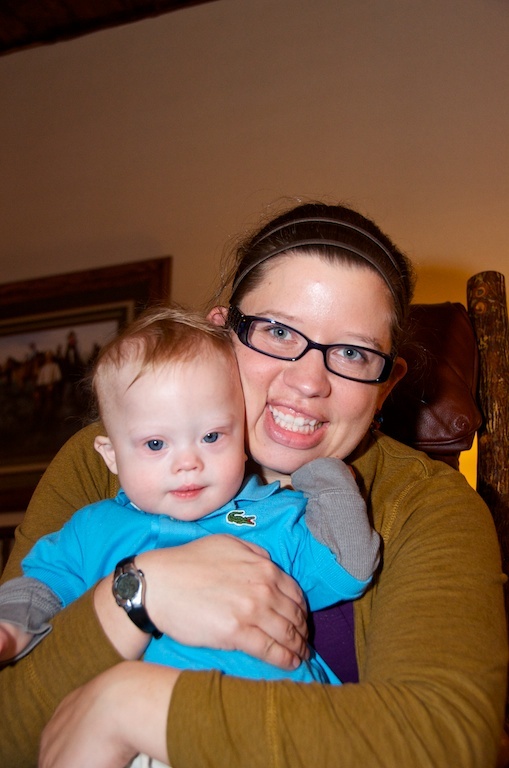 Caleb can even turn on Facetime and call my mom on his own–and frequently does! And the grandmothers have been recording stories with “A Story Before Bed” so the boys can listen (and see) them read stories to them. Our family is pretty spread out, so we’re all about technology! We love it! At Mother’s Day they were doing a special where you could pay month-to-month for $10/mo. We got both mothers 2 months worth, but I learned that INSTEAD, we should have just gotten our own subscription, and given the mothers the sign-in information. That way all the books are on the same “bookcase,” which is much simpler. Enjoy! Just recorded my first one from the free version 🙂 is the subscription worth it? Noah is so cute. We have great grands leaving pretty close so Levi gets to see them from time to time. You really cannot beat two birthday cakes! His sensory blanket turned out great! What a wonderful gift. While I am a little sad that he missed your mama’s graduation, I think it is great he got to meet his great-grandmother! Sadly, my Ellie never got to meet any of her great-grandparents. I really wish she could have met my father’s mother. 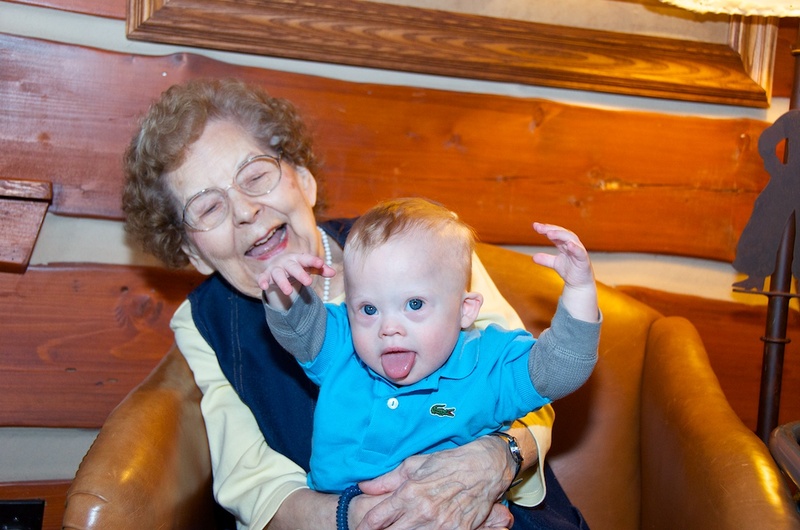 My aunt has Down syndrome as well and I just know my grandmother would have been “tickled pink” so-to-speak when Ellie was born. Anyway, what I am saying is that I am so happy that Noah was able to meet his great-gma. Also, congratulations to your mama! I just have to tell you! I look forward to your blogs. Noah and Otto are so similar, even though they are about a year apart. Otto is taking his first trip this month. He’ll be 8 months old, and guess what!?!? He’s going to visit his great-grama too! She is going to be 100! I am excited…except for the location…Indiana in July…are we crazy or what!!! We are fortunate that my grandmother ( baby’s Great- grandmother) gets to watch the baby while I work. My dad lives out of state and we frequently Skype with him! That’s great that your child’s great grandma gets to be so involved in his life! It’s also cool that you guys are using technology to stay connected to family.